Sharpton said most black leaders, except for Obama, are silently doing nothing while West considered Obama to possibly be no more than a “black mascot” for the wealthy. Good. Expose Al Jolsen for the fraud he is. What a fraud minister and fraud politican. You supporting that wacked out crazy Prophet dude? Bishop Jordan? Dude has a mural in his house with your face on it?? I lost respect for Sharpie when Tawanna Brawley was found to be a straight liar and you didnt even apology to all parties. You are a sucka for the rich and connected. That includes Elite, Frats, Masons, Eastern Star, all you Oath takers. I somehow feel that someone is going to shut Cornell up one day. He speaks the absolute truth. I had no interest in seeing this crap, especially one run by Ed Schultz. But, I would have LOVED to see the two men head off. And yeah, West is right. Al is being Al. Obama’s new black tool. Hate me all you want, but the truth is the truth. loved what al had to say on that front. cornel and tavis have been criticizing the president every since he stepped in office (and before). there is a difference between criticizing and critiquing. So? Bush got criticized when he came in? What makes Obama different than any other president? Screw Al. If it don’t make dollars it dont make sense to him. fuc bush! he needed to be smacked upside the head AND criticized. I feel the same about Bush as I feel for O Bammy, GHWBush, Reagan, all them Elitist clowns. O bammy is Bushes cousin hello!!! Well, view this as a dress rehearsal for what is to come. It was just a matter of time before the Obama apologists would have to face off with those who are not afraid to hold him accountable. Now Dr. West, was that really necessary? Yeah why should people be afraid? Why would anybody vote for a candidate based on their race? Some people are like mindless drones. It’s all about being an Elite, has nothing to do with race. And Shut up Al Jolsen. If there was ever any doubt (and I used to doubt to try to give Sharpie the benefit of the doubt, but no longer) about Sharpton’s true character, there should be no more mistake. He has shown his true colors ever since massa O invited him to the White House. Sharpie is an opportunist in the purist sense of the word, and has quite obviously been bought and paid for by this sinister, divisive, destructive White House. First Tavis and now Dr. Cornel have my deepest admiration for daring to speak out in spite of the ST UPID minions of Black folks who are EMBARRSING us all by continuing to apologize for this shill in the White House who even OTHER PEOPLE SEE is taking his most loyal constiuency for granted. P.S….I know one thang!, this POTUS is the BEST chance/time for the people TO stand the fk up & demand WTF we all need! “This” man/POTUS wouuuuuld DO “something” if “We” demanded it! He would give WAY morrrrrrre than a damn than any other! Also Black/righteous people, it’s like this…would you rather take your ONLY dog out of the fight?, or make him do what you “need/want him to do, while still IN”, the G.D. fight!? Thank or stank about it! Chuuuuuuch! 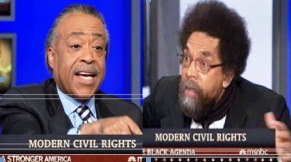 Unfortunately for Cornel West and Al Sharpton they haven’t learned how to get their points across ala, good communication skills without shouting at each other. After all the years of education and experience you would think they would have learned some good communication skills. If these guys are what African American people are relying on these guys to represent us we’d better think again. Now, I’m not faulting them for things they have done for the movement but communications is a key factor and shouting at each other just won’t cut it if your supposed to be on the same team..
I’m sayin….with all that he’s GOT to deal with?, he may never even “get to” do anything for…US, even in his LAST term, if he IS…re-elected! Plus, & “feel me” ‘on dis?..He’s a HELLA “inspirational figure” for Us AND “others”!! ?, but! !…He?, is NOT?, a damn…”Black” leader! He’s the POTUS!! And it’s all these lazy as-s, gatekeepin,”in massa’s back pocket”, [paid off/check get’en, “haven’t done NUTHin”/a fkn thang! muthafkas, who arrrrrre “Black leaders”, who shouuuuuld be ‘on the “hotseat”!, about WTF THEY HAVEN’T done!!! For them?, or ANYone to be all ‘on Obie?, is no more different than being a fkn…Republican/Palin/Beck/Bill O’YT/Limbaugh or any of the OTHER racist muthafkas out thurr! See?, once again?, “Ole Willie Lynch”?, has raised his stupid fkn head! But?, I digress! “We/Black people have seemed to have forgotten WTF We have been through in this country, & just WTF a “big as-s deal” it is “to have” an A.A. POTUS! Example…K. Kardashian is ‘on the hotseat with HER peeps (Armenians), for simply being on the cover of the “Turkish” Cosmo, (something “she” had NO control over!) in the month of April, due to “this” month being a time uaually respected for the Turkish/Armenian conflict! Now…just imagine if “We” were as historically/self respectful/NON BUDGING ‘on OUR shyt!, & weren’t “able tah BE”…bought off! Sheeeeit!, we wouldn’t even neeeeed a damn “leader”! We?, need to RzTF up & be the strength, we USE tah “have”! But hey?, again?…I digress!